You probably already know that April 22 is Earth Day. This year marks the 49th anniversary of the “birth of the modern environmental movement” inspired by former Wisconsin Senator Gaylord Nelson after witnessing the aftermath of the 1969 oil spill in California. The first Earth Day in 1970 was the catalyst for change, soon followed by the creation of the United States Environmental Protection Agency and the passage of the Clean Air, Clean Water and Endangered Species Acts. The last Friday in April is also when we celebrate Arbor Day. So, in honor and celebration of our Earth, air, water, animals and trees, we are excited to share this issue with you! One of our articles this month is about Liberty Wildlife, a Phoenix organization dedicated to wildlife rehabilitation. This one is close to my heart because Liberty Wildlife volunteers have been to my house on four different occasions to rescue adolescent owls who have unsuccessfully fledged from the nest and stranded themselves under our grapefruit tree in the hottest part of summer. My kids and I delivered another owl to their beautiful facility and watched as they examined him in preparation for his rehabilitation. Happy endings for all of the owls! You’ll also find articles on climate change, the importance of trees, eating green, living green, and people and businesses dedicated to protecting our Earth and its creatures through thoughtful, selfless actions. I learned so much as I read through these stories and felt surprised, enlightened and inspired along the way. Like so many of us, I wholeheartedly believe in doing whatever I can, whatever we can, to take better care of our planet. But even the best intentions are stifled by life’s hectic pace. This issue inspired me to take action… to find ways to reduce my own footprint and to give more of my time. There are lots of Earth Day events to choose from in this month’s Green Scenes, making it easy to walk the walk. I hope it inspires you too! Happy Earth Month and Arbor Day! 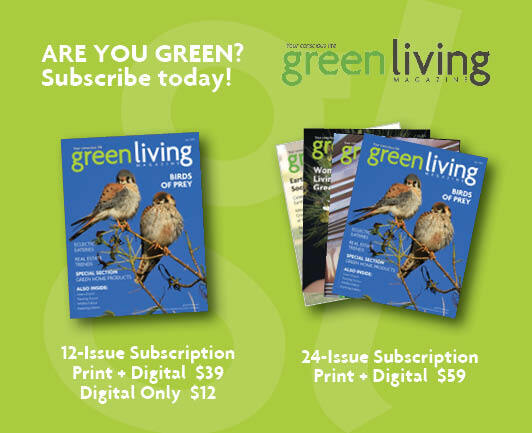 Subscribe for 12 months of Green Living delivered to your home or your email.